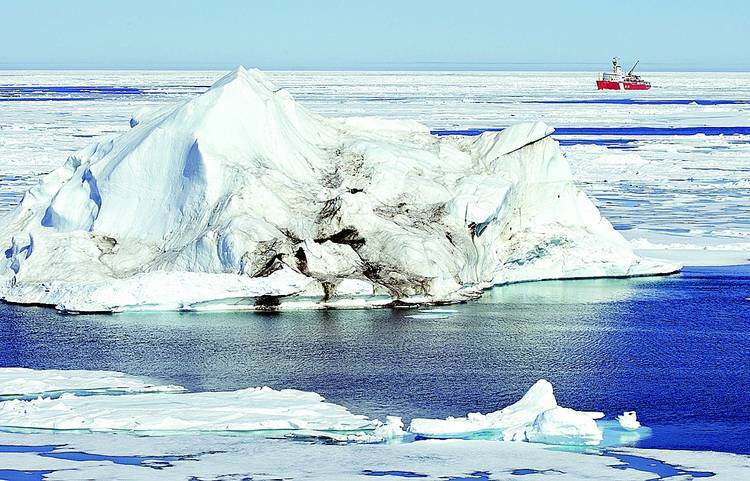 Canada, the US, Norway, Russia, and Denmark have been gathering scientific evidence for more than a decade in an effort to increase their continental shelf claims in the Arctic Ocean Region. "This is about a long-term investment in potential resources," says Martin Pratt, director of research at Durham University's International Boundaries Research Unit. "If states don't claim their territory, there's a possibility that the global community will say, ‘No, sorry, you missed your chance.'" The potential delimitation dispute between Canada, Russia and Denmark seems to focus on the Lomonosov Ridge. An Arctic Ocean Conference, held in Ilulissat, Greenland (27– 29 May 2008) resulted in the Ilulissat Declaration in which Canada, Denmark, Norway, the Russian Federation and the United States of America reaffirmed their commitment to working together within an existing framework of international law. The Declaration stated that the law of the sea provided for important rights and obligations concerning the delineation of the outer limits of the continental shelf and a legal framework to the orderly settlement of any possible overlapping claims. With this existing legal framework, providing a solid foundation for responsible management, there was no need to develop a new comprehensive international legal regime to govern the Arctic Ocean. The North Pole is located about 400 nautical miles from the northernmost island of Canada, Denmark, Norway and the Russian Federation. Under international law coastal state rights over the water columns are limited to the 200 nautical mile Exclusive Economic Zone, using the state’s territorial sea baselines as starting point. The ocean surface and water columns beyond 200 nautical miles are “high seas” and open to exploitation by any state. The Arctic chart prepared by Durham University clearly illustrates the extent of the uncontested Exclusive Economic Zones of the five states bordering the Arctic Ocean and also the relatively small expanse of remaining "high seas" or totally international waters at the very North of the planet. If sovereign rights extend beyond 200 nautical miles, they can only concern the seabed and subsoil – under the continental shelf regime in the United Nations Convention on the Law of the Sea (UNCLOS), in other words : under the UNCLOS, exclusive claims can be vastly expanded for Arctic nations that prove that their part of the continental shelf extends beyond that zone. Currently, under international law, Canada, Denmark, Norway, Russia and the US – the five countries with territories near the Arctic Circle – are allotted 200 nautical miles from their northern coasts. As defined by the UNCLOS, states have ten years from the date of ratification to make claims to an extended continental shelf. Countries must submit proposals to the UN Commission on the Limits of the Continental Shelf to request an extension of their nautical borders. Russia has ratified UNCLOS in 1997. On December 20, 2001, Russia was the first country to make a submission to the UN Commission on the Limits of the Continental Shelf (CLCS) in accordance with the United Nations Convention on the Law of the Sea (article 76, paragraph 8), based on believes that the eastern Lomonosov Ridge is an extension of the Siberian continental shelf. In 2002 the CLCS neither rejected nor accepted the Russian proposal but requested more data from Russia. In August 2007, Russia planted its flag on the Arctic seafloor directly beneath the Nort Pole. Planting a flag in itself is inadequate to base a claim of national sovereignty to the seafloor. Planting a flag is not a legal method of acquiring territory under international law, it may represent an act of provocation inconsistent with the spirit of state obligations under international law. "The Arctic Sea's geomorphology and geology are factors that cannot be changed, even if Russia or the Commission on the Limits of the Continental Shelf ultimately chooses to characterize certain submerged formations favorably toward Russia's claim." Norway ratified the UNCLOS on 24 June 1996 and had through 2006 to file a claim to an extended continental shelf. On November 27, 2006, Norway made an official submission. There are provided arguments to extend the Norwegian seabed claim beyond the 200 nmi (370 km; 230 mi) EEZ in three areas of the northeastern Atlantic and the Arctic: the "Loop Hole" in the Barents Sea, the Western Nansen Basin in the Arctic Ocean, and the "Banana Hole" in the Norwegian Sea. The submission also states that an additional submission for continental shelf limits in other areas may be posted later. On November 16, 2004, Denmark has ratified UNCLOS. Denmark and Greenland have submitted a claim for 62,000 square kilometres of Arctic sea floor. The Danish autonomous province of Greenland has the nearest coastline to the North Pole, and Denmark argues that the Lomonosov Ridge is in fact an extension of Greenland's landmass. Canada ratified UNCLOS on 7 November 2003. December 2013, the Canadian government was expected to submit an application to the UN Commission tasked with evaluating which countries can claim exclusive rights to resources — namely oil and gas — found in waterways far beyond their borders. Instead, however, the country made a surprising pivot: at the insistence of Prime Minister Stephen Harper, they submitted a partial application rather than a full one. That's because, according to The Globe and Mail, Harper wants government scientists to seek additional data that would support a more expansive claim — one that includes the North Pole, based on the undersea Lomonosov Ridge which runs from near Ellesmere Island under the magnetic pole. Since the U.S. has yet to ratify the UNCLOS, the date for its submission is undetermined at this time. Despite not being a party to UNCLOS, the U.S. submitted a protest that stated the Lomonosov Ridge “is a free-standing feature in the deep oceanic part of the Artic Ocean Basin, and not a natural component of the continental margins of either Russia or any other state." The UN submissions do not lead to a binding decision but lay the groundwork for future country-to-country negotiations over competing territorial claims in the Arctic that could take years to resolve. The United Nations Commission on the Limits of the Continental Shelf will be compromised if the countries involved submit overlapping claims. Prior coordination and/or a future joint submission would be the options to handle the dispute. To clarify the legal status of the Lomonosov Ridge, Canada, Denmark and Russia could submit a specific question to a tribunal, e.g. the International Tribunal for the Law of the Sea (ITLOS), the International Court of Justice (ICJ), the Permanent Court of Arbitration (PCA) or an ad hoc tribunal to determine the status of the ridge and to delimit their boundaries. There are too many interests involved; strategic, economic, scientific and defense interests and even domestic political interests. Besides, if (part of) the North Pole will be 'high seas' in the future, the Common Heritage of Mankind principle is probably applicable which means other than Arctic countries (China) might have interests in the Arctic as well. Baker, B., "Law, Science, and the Continental Shelf : the Russian Federation and the Promise of Arctic Cooperation", American University International Law Review, 25 (2010), No. 2, pp. 251-281. Byers, M., International Law and the Arctic, Cambridge University Press, 2013. Warner, J.T., "One Small Step for a Submersible, One Giant Land Grab for Russian-Kind: An Evaluation of Russia's Claim to the North Pole under International Law", Naval law review, 57 (2009), pp. 49-104. En wat gebeurt er nu als bijv. Rusland zonder meer gaat boren?